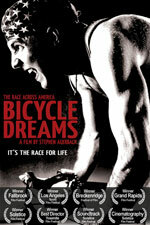 Bicycle Dreams is a full length documentary that chronicles the 2005 Race Across America. As a chronicler of cyclocross racing, a decidedly shorter affair, I was a bit hesitant when the film’s director, Stephen Auerbach, asked if I wanted to review his film. Bicycle Dreams Tells the Story of the 2005 RAAM. Photo by Chris Milliman. To hedge my bets, and ensure my ignorance about ultracycling events is kept in check, I recruited Adventures for the Cure’s Adam Driscoll and Patrick Blair, accomplished ‘cross racers and RAAM finishers in the two-person division, to watch and comment on the film. Cyclocross racing is hard and, if you are doing it right, painful. It’s a redline effort for somewhere around an hour and then it’s over. RAAM, on the other hand, is more of a slow burn. Full-time steady-state efforts, day after day with little time off the bike and almost no sleep. Cyclocross is like a haymaker to the head, RAAM is 15 rounds of rabbit punches, a 45 minute break, and then fifteen more rounds. For nine straight days. Bicycle Dreams tells a compelling story. From a technical and aesthetic standpoint the film is amazing. The shots are artfully framed and flawlessly executed. The color grading and lighting in the film are breathtaking. For this alone, the film is worth viewing. The idea of a race across America in itself is, dare I say, epic. Finishing this event is truly an achievement only a small number of bicycle racers will accomplish. The human struggle, exhaustion, will-to-go-on and desire-to-quit is the kind of stuff compelling, edge-of-your-seat films thrive on. The problem is that once you get beyond the big picture “epicness,” the actual competition is mind-numbingly dull. It’s equivalent to going out and watching an accomplished racer on a long solo training ride. This is not the Tour de France. There are no suicide breakaways, tactical chases, sprint finishes or mountain-top duels. Not to give away any plot points, but there is exactly one instance in the film in which we see a rider passed by a competitor. To overcome the sport’s inherent lack of on-bike action, the filmmakers focus on the meta. The real drama is found in the racers’ back story, the mind-over-body struggle, and competitors’ interaction with their crew. Robic and his Slovenian Army crew. Photo by Chris Milliman. Baloh, being the perfect foil to Robic, is human. A characteristic he treats as a weakness. As the underdog, Baloh believes that he must be harder than Robic to best his countryman. He refuses to speak with his rival and does not consider them friends. Ironically, it is the hardened soldier, Robic, that comes across in the film as the more compassionate character. He explains away Baloh’s tough talk as the influence of the challenger’s team director and supporters and wishes him success in the race. The other compelling storylines include a cast of characters straight out of the Oceans 11 franchise. There is the plucky mohawked Brit that has shattered more bones in his body than Evel Knievel and spends half the race with a seat cushion duct-taped around his neck, the lovable but irritable Frenchman who is constantly arguing with his chain-smoking crew chief, the 53-year-old orthopedic surgeon from Iowa that exudes Midwestern wholesomeness and truly loves the sport, and a Swedish veterinarian that hasn’t told her parents she is competing in the race. For the most part the film is well-paced, but it is a tad slow in parts. The director does a nice job presenting pre-race interviews that show the competitors full of vitality and optimism. These clips are contrasted with the reality of the inhumane conditions the racers willingly endure. Baloh rides into the sunset. Photo by Chris Milliman. That Bicycle Dreams is not truly a “cycling movie” is probably a plus in that non-gearhead bike geeks will still be drawn into the film and the human drama that accompanies the race. Being a gearhead bike geek, however, I have a couple quibbles with parts of the film. First, we never get to learn anything about the bikes. No explanation about what gears these guys are using, the benefit of handlebar extensions or training regimens. In a couple scenes we see racers hooked up to IV bags during their rest periods. I’m assuming this is to replenish fluids and stave off dehydration. But in today’s climate, in which everything cycling-related is looked at with a jaundiced eye, if needles and IV bags show up anywhere near a cyclist, there really needs to be a good explanation of what is happening in that scene. My only other real issue with this film is that there is a tendency not to trust the viewer. It goes without saying that what these athletes are doing is the most difficult thing they ever endured. Although it goes without saying, the filmmakers seem unsure whether we are able to comprehend that message, so we keep hearing this over and over again. These guys can’t stand up, they are emaciated, falling off their bikes from exhaustion, hallucinating, fighting with their crew. What they attempt is near impossible. Message received. Despite these minor quibbles, Bicycle Dreams is worthwhile viewing. It is a film you can watch with a non-cycling significant other or slip into the DVD player on your next two-hour trainer session. It’s hard to whine about what hell it is to ride a trainer while watching competitors destroy themselves for nine straight days. Patrick Blair and Adam Driscoll are founding members of charitable organization and bike racing team, Adventures for the Cure. Along with being accomplished cyclocross racers they have also competed in the two-man division of RAAM. Driscoll and Blair are featured in their own bicycle-related documentary Adventures for the Cure:The Documentary, that tells the story of a cross-country trip on fixed-gear bicycles. You should go pick up a copy of Bicycle Dreams and the AFC movie and hold your own two-wheeled ultra-endurance film festival. I sent Adam and Pat a copy of Bicycle Dreams and asked them to watch it and jot down their thoughts. Here is what they had to say. Pat Blair: Having raced as a two-man team and knowing how crazy hard that is, I think that the movie portrays very well how RIDICULOUSLY hard solo RAAM is. It is not fun, it is pure H-E-Double Hockey Sticks and I think that come through in the movie very well. The movie does a great job of covering quite a few of the racers, the contrast between how each of them are handling the race both mentally and physically is pretty cool to see. It also does a great job of getting each crew’s perspective. Anyone and everyone who is even considering doing solo RAAM should be mandated to watch this movie. Hopefully it will help them to realize exactly what they are getting into. There are very few people in the world who can both mentally and physically complete this race, and to even try is to literally take your life in your hands (or handlebars). On the downside I think the movie lacked excitement and variety. It was hard to stay focused on what was going on while I was watching it… I got kind of bored with the whole thing. As an informative documentary the movie is very well done, as pure entertainment there is something to be desired. Adam Driscoll: One aspect of the documentary I think they captured very well is how much mental toughness plays a HUGE part in this type of race when you race as soloist. You can physically only do so much to prepare. With doing the race twice on a team especially as a two man team I know a little bit about what those guys were facing about having to get back on the bike when you are completely exhausted. Mentally you just have to break yourself and the movie portrays this very well with Jure Robic and a few others. Something else I really liked about the movie is they showed you how important your crew play in this type of race. Jure’s team knows him well and how to get him to relax and get back on the bike after short rests. Usually people don’t understand how important it is to have a crew that knows you and knows what gets you motivated. This movie has also sealed the deal for me not doing Solo RAAM for a long, long time. It really shows how tough you have to be to do something like this. Every time I think about doing Solo RAAM I just have to think about this documentary and think how I felt in 2 man RAAM with Pat in 2009 and that will convince me not to do it. It was sad to see tragedy accompany the race but it just shows you how difficult and dangerous this race really is. For more information on Bicycle Dreams visit bicycledreamsmovie.com. I attempted solo RAAM and dropped out at the Mississippi in 2006. I got Bicycle Dreams as soon as it was available on DVD. I think it’s an excellent movie. It does a good job of showing the emotion and the suffering. It would be impossible to really show what happens to a racer during the race. I can’t imagine the task of taking a 9 day race and cutting it to a w hour movie. Next Next post: Super Bowl Sunday Snowpocalypse PsychoCross D.C. Stage Race! !